On a typical afternoon in Victoria, the streets echo with the sounds of people performing at professional and theatres, dance companies, art centers and even right downtown on the sidewalks. With top performers from the world coming to enthrall their audiences, Victoria has become a paradise for culture enthusiasts. Around any corner, you may stumble upon a talented busker, or come to a halt to enjoy one of the Inner Harbour’s many street performers. Besides the performing arts, Victoria is home to plenty of fantastic art galleries featuring First Nations, local, national and international art. Window shoppers and serious buyers will find something to love in Victoria’s galleries, as each offers a unique aspect. There’s something for every taste in Victoria, you just need to know where to look! Come discover Victoria’s numerous galleries and theatres, and maybe even stumble upon something completely new! Founded in 1948 as the Doncaster Players and spearheaded by Mrs. Flora Nicholson, the wonderful people, now-dubbed the St. Luke’s Players, have been enchanting Victoria locals ever since. At the invite of Canon Pike, the group moved up the street from their original location and into St. Luke’s Church Hall. There they began to put on 2+ plays every year. Giving around 80% of their profit back to the church, and performing at many festivals and theatres all over the Island, it’s safe to say Canon Pike made the right decision in extending the invite to the group. They even put on a performance at the Government House. Keeping to their audience’s expectations and taste with the 1958 philosophy, “It is our aim to produce good, clean plays for your enjoyment,” the group has established quite the following and is a treat to see live. Get tickets in advance though, they are still consistently selling out performances. Ever since 1927, over a quarter of a million theatre enthusiasts have witnessed more than 3,000 performances presented by over 27,000 volunteers. The Langham Court Theatre is a fantastic place to visit and its buildings have experienced many ups and downs over time. Beginning as a humble carriage house and barn in 1876 that later burnt down and were rebuilt as a Girl’s School in 1912, the buildings didn’t actually begin construction to become a theatre until 1938. It was officially the property of The Little Theatre in 1940. Its grand opening featured “Freddy Steps Out” on September 20th, 1940. During the war years, the theatre experienced a major lack of hands, but still managed to pull off 4 plays a season. In drastic need of renovations and additions, the buildings and company continued to grow throughout the 50’s, carrying on into the 90s. Today, thanks to its audience, the Langham Court Theatre has become one of the most popular community theatres in Western Canada. It is well worth the time to check out both the buildings and a showing while in Victoria. Belfry Theatre is the largest and most famous professional contemporary theatre company on Vancouver Island. It resides in a beautifully restored, former Baptist Church that was built in the 1800s. With 12 or more shows a year, including summer productions, a main-stage series and a mid-winter festival SPARK featured in the theatre, there’s plenty of time to snag tickets to a showing. Having won awards in Toronto, Vancouver and Calgary, as well as having premiere productions acclaimed across Canada and overseas, the Belfry is right in line with its mission of producing “theatre that generates ideas and dialogue, and that makes the audience see the world a little differently.” Over 250 volunteers help put on the productions in the 280-seat theatre. They have worked hard within this not-for-profit organization to keep its award-winning status and to continue to enthral their dedicated audience. Anyone who has visited downtown Victoria has no doubt admired the stunning Alix Goolden Performance Hall, which earned its name after one of Victoria Conservatory of Music’s founders. Formerly a church, this venue is blessed with 800 luxurious seats and exquisite architecture—sophisticated stained glass windows, high, vaulted ceilings, and filigree iron railings. The overall feel of the building is simultaneously open and roomy, yet cozy with a sense of intimacy. Some of the highest forms of art have been featured in the hall including readings by internationally renowned authors such as Timothy Findley, Salman Rushdie, Margaret Atwood and David Suzuki. Voted Best Live Music Venue at the 12th annual M Awards, witnessing any type of performance at the Alix Goolden Hall is a fantastic experience that words can hardly convey. Located in what used to be a lumber mill ghost-town reborn into a charming seaside and artist filled community, the Chemainus Theatre Festival is a yearly delight that brings guests and performers from all over the world together. Between showings, wander the streets and gaze at the infamous murals that adorn the town’s buildings. Get the full “taste” of the Chemainus Theatre experience by visiting the Playbill Dining Room to enjoy a traditional dinner before the evening fun. The Gallery features more than 100 BC Artisans, so besides the performing arts, you’ll have the opportunity to be inspired by many other local creations. As a not-for-profit organization that strives to enrich the region, advance the arts and cultivate community, the theatre festival goes towards ensuring the lively performances can continue to bring life and enjoyment, as well as many guests, to this quaint and scenic town. The Art Gallery of Greater Victoria (AGGV) has numerous titles to its name, but first and foremost, it boasts having the largest public collection in British Columbia, with almost 20,000 works of art. Like every good art gallery, the AGGV has a colourful history, having opened its first exhibits in 2951 in a historic 1889 mansion. The same mansion can be seen next to all seven of its modern galleries. Of course, you can still take a walk through the Victorian mansion, as it hosts the Gallery Shop and offices. Thanks to the additions to the AGGV, it can now play host to the most prestigious, high caliber exhibitions and artwork. Inside, visitors will take a walk through Canadian, historical and Asian collections, as well as a showcasing of contemporary exhibitions. Most importantly, perhaps, is the permanent display of the most fitting artist’s work: Victoria’s own Emily Carr. The Art Gallery of Greater Victoria is a fantastic stop for any serious culture connoisseur, and is a vibrant dash of art and life in the artistic community of Victoria. Visit by donation on the first Tuesday of every month, and enjoy a free tour with facilitators on Friday, Saturday and Sundays at 2pm. Robert Bateman is a naturalist who has spent a lifetime capturing the beauty and freshness of nature. Both a recognized conservationist, dubbed one of the 20th century’s “heroes of conservation” by the Audubon Society, and one of Canada’s most famous artists, his work lead to the creation of the Robert Bateman Centre – an educational and breathtaking gallery located in the historical Steamship Terminal on the breathtaking Inner Harbor. The gallery inspires the preservation of the natural environment through both location and the featured exhibits of Bateman’s various paintings, sketches and sculptures. It also has gallery-based education programs. Visiting the Robert Bateman Centre is an enthralling experience and will make you think again about the beauty of nature. Enjoy guided or unguided visits and lunch at the Steamship Grill. Or, if you’re coming with a big group, sign up for a Corks and Canvas program that gives guests an event complete with trying your hand at sketching or painting and insightful conversation, as well as wine and canapés with local artists. Taking a stroll through Winchester Galleries can be equivalent to hopping into a time machine. The gallery specializes in a wide diversity of art, both past and present. Contemporary, European, and International paintings, as well as Historical art are the main types of art featured in this beautiful 3-storey gallery. Some of the famous artists represented include Arthur Lismer, Toni Onley, David Blackwood, Lamb Bobak, Joe Coffey and many more. Running major exhibitions for 2-3 weeks at a time, there is always a wide range of art from all different time periods to entice investors, collectors and admirers alike who are visiting Victoria. Located in the pleasant Oak Bay Village, the gallery is just a 5-minute drive away from downtown Victoria. Its ever-expanding collection and display is a worthwhile stop for any art aficionado. Vivid and breezy, the West End Gallery’s style is unique compared to other galleries in Victoria. With colorful art featured by more than 100 Canadian Artists in the form of paintings, art glass, and sculpture, visiting this gallery will definitely marvel you. Owning 2 locations, the original in Edmonton and the 1994 location right here in Victoria, the family-operated art gallery has stayed true to, and featured, Canadian art since 1975. Whether you’re looking to purchase a new piece for your home, or are just interested in exploring and admiring work from both emerging and established artists, the West End Gallery is a refreshing place to enjoy some of Canada’s fantastic artworks. To reach it, go one block from Government Street in the downtown, at the corner of Broad & View. 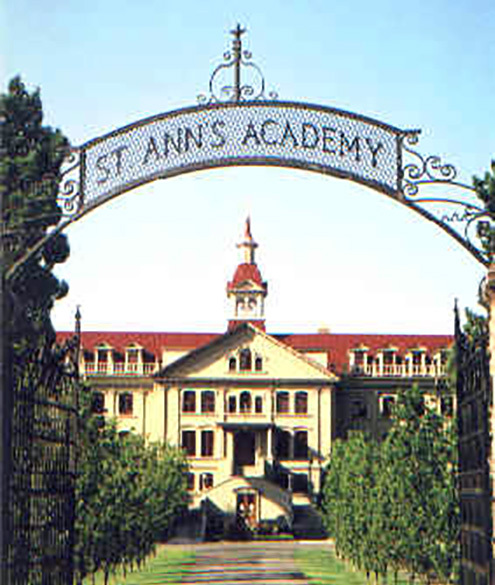 St. Ann’s Academy is a National Historic Site located in the heart of downtown Victoria. Our site spans over 6 acres; the grounds include an award-winning garden experience, a heritage orchard and a private novitiate garden. Built between 1871 and 1910, portions of the interior have been beautifully restored, and include parlours displaying original oil paintings and are furnished with period pieces. The interior also showcases the stunning, original St. Andrew’s Roman Catholic Cathedral – now interfaith – as well as a theatre-style Auditorium. The grounds are open to the public from dawn to dusk, and the interior may be toured during certain business hours; the grounds and portions of the interior are available for venue rentals. No matter the reason for your visit, St. Ann’s Academy will create a one-of-kind experience that you and your friends and family will never forget!